Kuala Lumpur, 16 May 2014 – What began as a seemingly obscure programme almost 15 years ago at The National University of Malaysia (UKM) to commercialise the roselle plant has literally borne fruit in biomedical research into diabetes. UKM researchers Professor Datuk Dr Jamaluddin Mohamed, Assoc Prof Siti Balkis Budin and others found that extracts of Roselle (Hibiscus sabdariff), white mulberry and myrrh can be used as an agent to reduce the effects of major complications in diabetic patients. Speaking to the UKM News Portal at the Faculty of Health Science here recently, Prof Jamaluddin and Dr Siti Balkis said their study was to find the anti-oxidative effects of extracts of morus alba (white mulberry), hibiscus sabdariffa (roselle) and comiphora molmol (myrrh) on the liver of diabetic rats. Diabetes is a serious metabolic disease which is growing in epidemic proportions worldwide and made more difficult to treat due to various physical and metabolic complications. Oxidative stress plays a crucial role in pathogenesis of diabetic complications. Prof Jamaluddin said diabetes may attack all the major organs, including the liver and reproductive organs, particularly the testes that produces spermatozoa. Dr Siti Balkis said from the results, they were inclined to conclude that roselle, white mulberry and myrrh were effective for diabetic treatments. From a group of rats divided into six categories, three groups that were given roselle, white mulberry and myrrh showed signs of healing after treatment of the extracts. The other three consisted of non-diabetic rats which were given salt solution as a control, diabetic rats given saline solutions as negative control and diabetic rats administered with metformin – an oral anti-diabetic drug used to treat type-2 diabetes. Glucose levels of the three groups not given the plant extracts were not significantly lowered after 28 days of treatment when compared to the groups that were. However, protein and several anti-oxidant enzymes were found to be slightly higher in the groups without the plant extracts. Prof Jamaluddin said in 1999 when roselle was first planted at UKM – nobody thought the plant would have any potential for commercialisation. “Roselle may become the next CiliBangi,” he said excitedly referring to the chilli variety first grown by a UKM researcher in 1978. By 2011 Cilibangi became the de facto benchmark in quality of spiciness and taste in Malaysia and brought commercial success to the Chillibangi farmers. Prof Jamaluddin is hopeful that the fortunes of roselle could turn out in a similar way, after failure to commercialise it as a cordial health drink in the 1990s. Efforts to commercialise roselle were started by Universiti Malaya and the Department of Agriculture. The 1990s saw the rise and fall of roselle cultivation in Terengganu. The failure was not entirely due to the crop but more to do with business glitches. Roselle had just been introduced into the market but there were lapses in consumer acceptance and marketing. 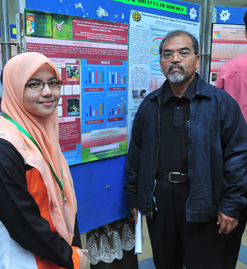 When joining UKM, Prof Dr Mohamad Osman from the Malaysian Agricultural Research Development Institute (MARDI) wanted to continue work on rice and fruits. However research on fruits were too long-term in nature thus discouraging many students especially undergraduates wanting to do fruit research. He had thus to look for alternatives and hit upon the plant roselle. There was no research funding available but Prof Mohamad pressed ahead with whatever funds he got to look for a plant that could become important. He found research papers from Europe about plants from the tropics that had anti-oxidant properties and his hunch was to put everything into roselle. The rest, as they, say, is history. Three varieties of roselle have been grown successfully in the UKM campus in Bangi near the Institute of Systems Biology (INBIOSIS).